Energy Conversion and Management has an open access mirror journal Energy Conversion and Management: X, sharing the same aims and scope, editorial team, submission system and rigorous peer review. 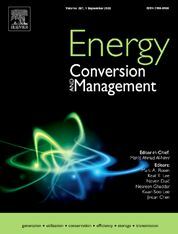 The journal Energy Conversion and Management provides a forum for publishing original contributions and comprehensive technical review articles of interdisciplinary and original research on all important energy topics. The topics considered include energy generation, utilization, conversion, storage, transmission, conservation, management and sustainability. These topics typically involve various types of energy such as mechanical, thermal, nuclear, chemical, electromagnetic, magnetic and electric. These energy types cover all known energy resources, including renewable resources (e.g., solar, bio, hydro, wind, geothermal and ocean energy), fossil fuels and nuclear resources. Papers are welcome that investigate or consider the prospects of energy technologies, devices, systems, materials, processes, operation, performance, maintenance and control. Priority may be given to interdisciplinary energy subjects that deal with advanced technologies and that consider more than one of these methodologies: modeling, experimental, analysis and optimization, with appropriate verifications of the findings.